I came across this plaque yesterday while walking past Parnell Square in Dublin. 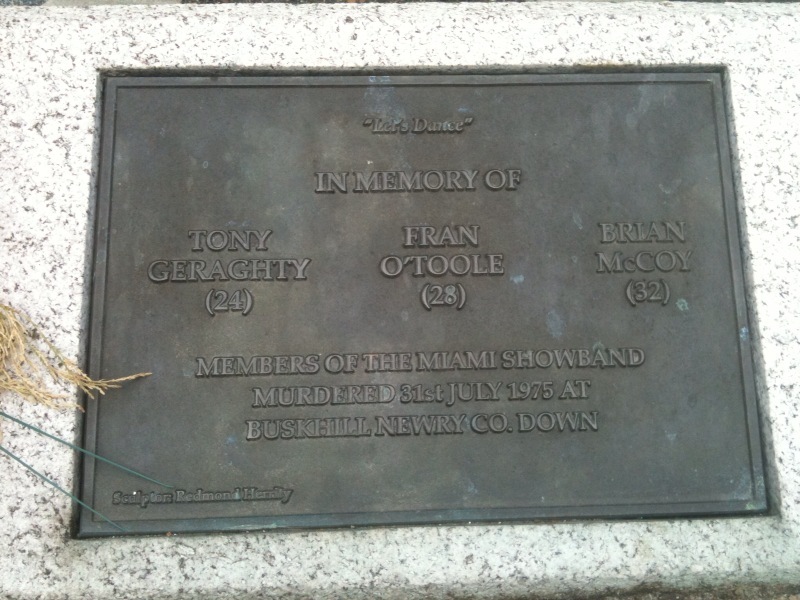 The plaque is in memory of the three members of the Miami Showband who were murdered by loyalist terrorists and rogue members of the Ulster Defence Regiment of the British Army in 1975. Britain: Portsmouth is heavily bombed. Germany: The RAF makes its first bombing raid on Berlin. Chad: Charles De Gaulle, leader of the Free French receives a big boost in the battle for the French colonies when the French Army in Chad pledge their allegiance to his movement, rather than that of the collaborating regime in Vichy, Southern France. At this stage, about half of France's colonies in Africa half vowed to support De Gaulle. In some cases there have been bitter and violent struggles in the colonies between Free French and Vichy officials and Army personnel. Ireland: The war has come to Ireland. 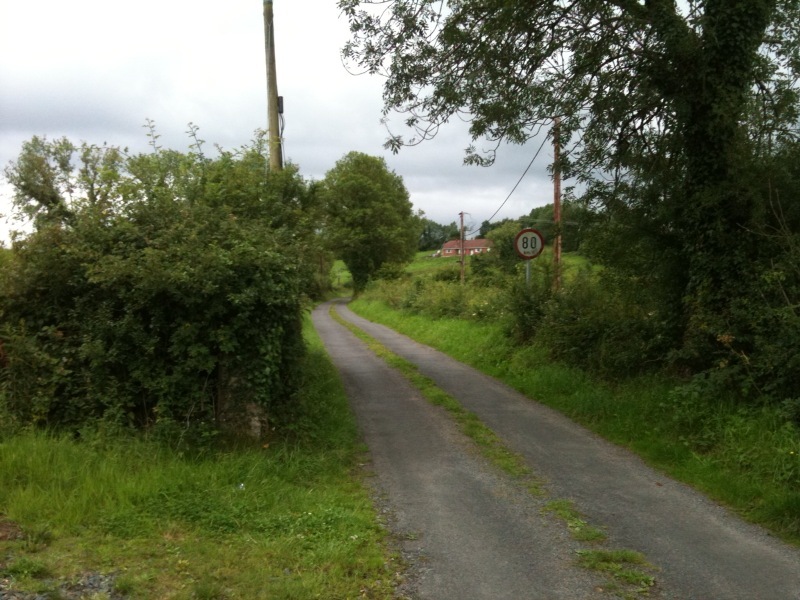 On this day 70 years ago four Luftwaffe planes bombed the rural village of Campile in Co Wexford. The Village was badly damaged. Three young women, two of them sisters were killed while working in the village creamery. Unlike later more devastating raids such as that on the North Strand in Dublin, the German claim that on this occasion they were lost seems unlikely to be true as this raid took place in broad daylight even though it is conceivable the Germans thought they were bombing Wales not Wexford. There are some wild theories as to why this village was bombed. Some of these can clearly be discounted, such as the claims that boxes of the butter made at this creamery were found by the Germans on the beaches of Dunkirk after the recent British evacuation there. And that the Germans bombed the creamery deliberately to remind the Irish that as neutrals, they were not supposed to be supplying one side. The truth will never be known but it is quite possible that the raid was a reminder from Hitler to De Valera what Germany would be capable of doing to Ireland in the event that we abandoned our neutrality. The quiet village of Campile in South West Ireland was bombed by the Germans 70 years ago today. Last weeks edition of Newsweek was controversial for two principal reasons. Firstly It listed the the worlds ten best leaders. King Abdullah of Saudi Arabia featured on the list, much to my and and most normal thinking peoples astonishment. His reforms were mild and the Saudi Kingdom remains one of the most oppressive countries on earth. The fact that the 86 year old is on the list, for me, invalidated the whole project. Anyway lets go on. 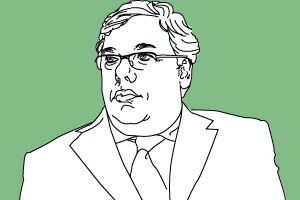 You know from the picture that our own Brian Cowen was among the greatest. I don't have a whole lot to say about Cowen except that I have admired his fiscally responsible spending cuts but cannot get over the fact that the banking collapse occurred during his tenure in the department of finance. Furthermore it was is economic model that proved to be so unsustainable. To put it simply I think he is a much better Taoiseach than he was Minister for Finance. He has also failed to impress me on the north. His criticism of dissident republicans has been for too mild in my opinion. Newsweek however was more kind. With Ireland's once-roaring economy staggered by the banking crisis--unemployment is at 13 percent, emigration is rising, and the money markets rank Ireland not far behind Greece on the list of Europe's big-time losers--Prime Minister Brian Cowen and his able finance minister, Brian Lenihan, are prescribing harsh medicine. They've pushed through austerity packages drastic enough to win the admiration of the international community, raised taxes, and slashed some public salaries by more than 10 percent. But the Irish aren't showing much gratitude--Cowen's ratings have plunged to a mere 18 percent, and his Fianna Fail party can expect a drubbing in the 2012 national elections. Still, there's some hope that his government's unpopular measures will be rewarded in the long run: surveys suggest that Irish consumer confidence is on the rise again, and the economy notched up modest growth in the first quarter of 2010. The other leader that immediately struck me was Liberian President Ellen Johnson Sirleaf. I have followed the path of this remarkable woman's career ever since she was elected Africa's first female leader in 2005 in the wake of the Liberian Civil War which was in my opinion the second worst conflict of the 21st century after the Civil War in the Deomcratic Republic of Congo. Newsweek says all that needs to be said about this great woman. When Ellen Johnson Sirleaf was elected Liberia's president—and Africa's only female head of state—in 2005, she inherited a country decimated by years of violence. Between 1989 and 2003, two horrific civil wars had killed as many as 250,000 of Liberia's 3 million people, and displaced thousands more; more than 15,000 U.N. peacekeepers were deployed on the ground to maintain a fragile peace. At the time of her election, Sirleaf—who held positions at the World Bank and the U.N. before her political run--told NEWSWEEK, "I'm most concerned with being a mother to Liberia. I want to heal the deep wounds of this nation." Now, five years later, fewer than than 8,000 U.N. troops remain in Liberia. The country has boosted school enrollment by 40 percent, restored power and running water to urban centers, and turned its timber and diamond industries into thriving—and legitimate—trades. 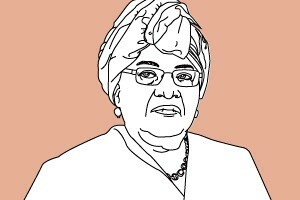 Sirleaf has also slashed Liberia's external debt from $4.9 billion in 2006 to $1.7 billion today. Under her leadership, Liberia is a country rebuilt and reborn. I also take great satisfaction in knowing that the Irish Army played a significant role in the stabilisation of that country. The UN mission which had a strong peace enforcement mandate supervised the ceasefire, confronted gangs that would not comply and oversaw their disarmament and the democratic transformation which thus far has been a great success. The IDF even participated in the arrest, detention and transfer to Den Hague of former Liberian President and utterly psychotic butcher Charles Taylor. Such was the high esteem in which the Irish Army were held that upon the completion of their tour in 2006 President Sirleaf made a specific request to the Irish government that the troops remain in the country for a further six months, a request that was granted. The other reason the Newsweek edition received much attention was that it listed the worlds greatest countries to live in. Finland came first. America was not happy at being placed just outside the top ten at number 11. The lack of health care coverage and other other absences of the European style "social net" were the reason the US came 11th. I largely stayed clear of the health care debate in America but always saw it in fairly simple terms. American health care is the best in the world. Its just not accessible to all. So the real question is, when it comes to health care, which is more important, quality or accessibility? In any case America, don't feel too bad, Ireland came in 17th. It has been confirmed. President Obama is not a Muslim. Make sure you watch this hilarious clip from Jimmy Kimmel. 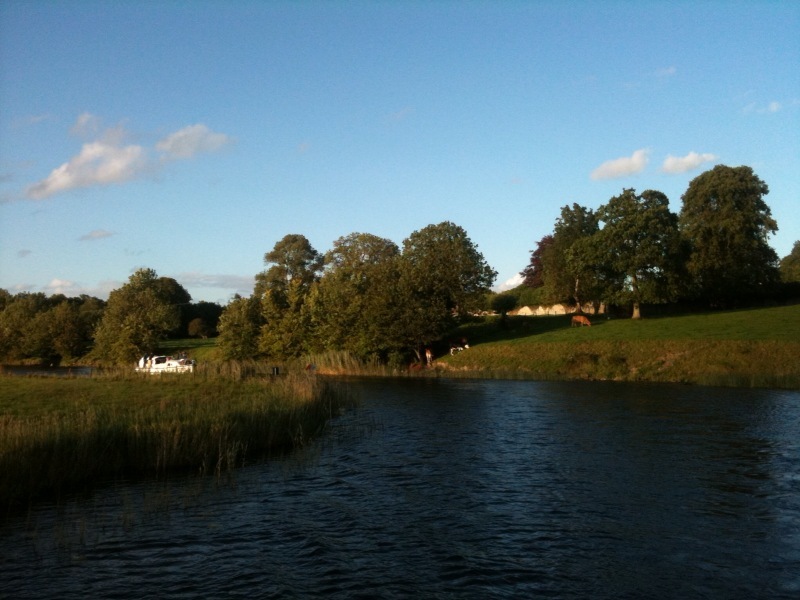 A typical scene along the beautiful river Erne, where I spent the last three days on my brother's stag party. 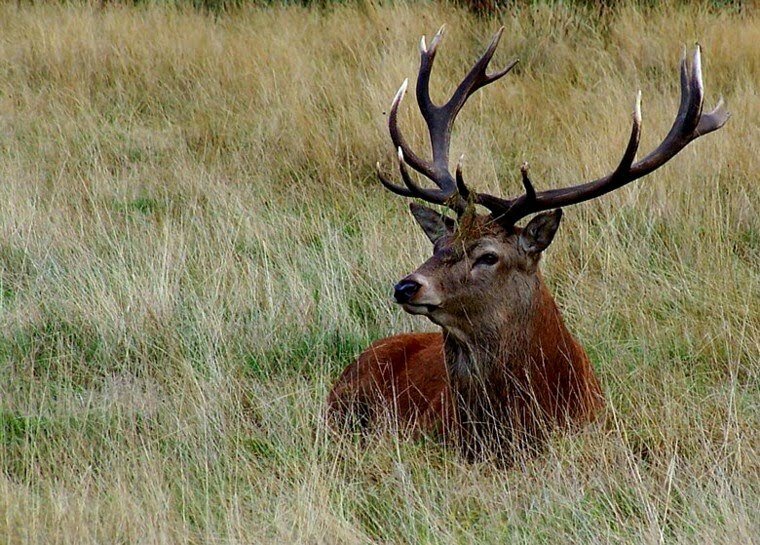 I'm going away for a few days for my brother's Stag Weekend (that's a bachelor party for my American readers). Forty of us are sailing three boats from Ballyconnel in Co Cavan to Leitrim Village. I will be off line until Monday. I will post some uncompromising pictures when I get back. I will also be on twitter if anybody is interested. In the meantime here's a round up of the best of the blogophere from the blogs I read. Paul over at "A Modern Libertarian" has a fascinating post about the need to liberalise Britain's gun laws. 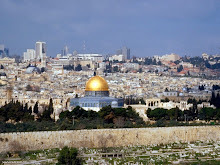 Gary from "Gary's Reflections" speculates on the chances of an Israeli Air Strike on Iran within 6 months and also has an excellent post on a Taliban War Crime. The Ground Zero Mosque, perhaps I should rephrase in the interests of fairness, the Mosque near Ground Zero is dominating the blogosphere. Gary weighed in here and Robert Avrech from "Seraphic Secret" has a go (mainly at Obama it must be said)here, here and here. For an alternative view on the Mosque controversy, read this post from the "Daiy Kos". Meanwhile Juan Cole from "Informed comment" has an excellent post that I would highly recommend on the US withdrawal from Iraq. That's it for me. I'm off on a wild weekend. On a separate note. Check out this outrageous footage from a bull fight gone wrong in Spain yesterday. And here is a little tribute to my up coming weekend. It hasn't gone away you know ! This is not going to go away. Listen to the ever articulate voice of youtube sensation Pat Condell on why the Mosque should not be built. 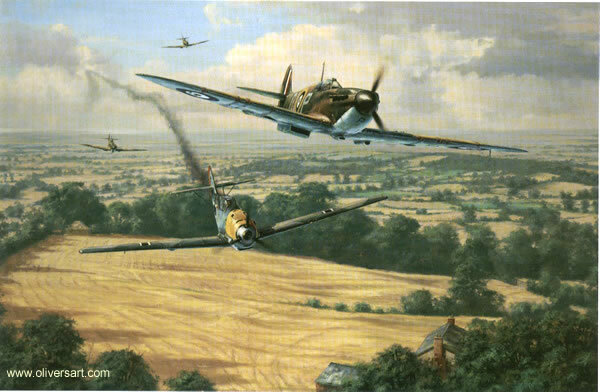 Britain: The Battle of Britain is raging. Hitlers Armies have conquered all of Western Europe. Only Britain remains undefeated. The Luftwaffe have launched an all out attack on the Royal Air Force in order to clear the way for a German invasion of Britain. It is arguably the most crucial battle of World War Two. On this day 70 years ago the RAF shot down 69 German planes over southern England. RAF losses were 33 shot down with another 29 destroyed on the ground in bombing raids. The last one was all about the sky line. 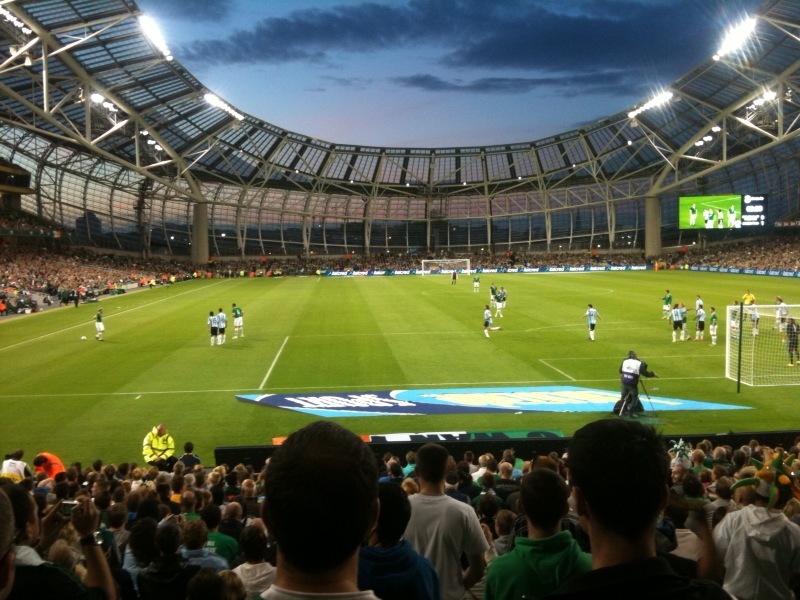 Here is a proper look at the new Aviva stadium at Landsdowne Road. Not many people in Ireland like to talk about the 11 month post independence Civil War that occurred between July 1922 and May 1923. The reason being that nobody comes out of it looking good. Neither the irregulars (IRA) or the new Free State Army conducted themselves with particular distinction, especially in the closing weeks of the war. But even more than that, the war is politically uncomfortable for everybody, and I mean everybody. Fianna Fail, the party descended from the irregulars don't like to admit that their forefathers conducted a bloody campaign against fellow Irish man in which they frequently used terrorist tactics, namely the targeting of families of pro Free State officials. Fine Gael the party descended from the Free State Army and its party, Cumman na Gael do not like discussing the Civil war for two reasons. One, the Free State Government was guilty of engaging in state terrorism when they executed prisoners in retaliation for IRA attacks on Free Sate politicians. Secondly, as the movement responsible for crushing militant republicanism in the South in the Civil War, Fine Gael became natural leaders in their criticism of the Provisional IRA during the Northern Ireland troubles. To this day they are the most outspoken critics of dissident violence in the north. So it does not sit very well with Fine Gael, the self proclaimed "saviours of the state" that their hero Michael Collins fought a war after the truce but before the Civil War, against the Northern establishment and the British army in the six counties that would rival the later campaign of the Provisional IRA in its intensity. The Civil War is also awkward for modern day Sinn Fein. Sinn Fein, the leaders of militant republicanism throughout the northern troubles would not like to admit some of the following facts. Although Sinn Fein historically would have more reason than most to see the Anglo Irish Treaty of 1921 as a sell out because it was the document that signed away the North this is not quite how it was seen by the northern IRA at the time. Many northern republicans to this day refer to southerners in a derogatory way as "Free Staters". But get this, during the 1919-1922 period the northern IRA adored Collins. He was, as mentioned already, very militant on the issue of the North. He continued to support, and indeed direct the IRA campaign in the six counties where the war against the British continued to rage even after the truce of July 1921. As a result many members of the Northern IRA came down south and actually joined the Free State Army. So next time you here a Sinn Fein activists refer to the "Free Staters" or complain about the passive south, remind him/her that many prominent members of the Free State Army, even those implicated in atrocities, were in fact IRA men from Belfast, Derry and Tyrone. And this leads us on to today's random piece of interesting history which is about the circumstances (largely unknown except for historians) leading up to the firing of the first shot in the Civil War. When the Treaty was singed in December 1921 it became clear immediately that there were divisions. The IRA, quite naturally saw it as a sell out. They had after all sworn an allegiance to defend the Irish republic. Its leaders were now being asked, if they were to become members of the parliament to swear allegiance to the king. The treaty debates of January and February 1921 examined every possible scenario but ultimately would only make clear who was on what side. 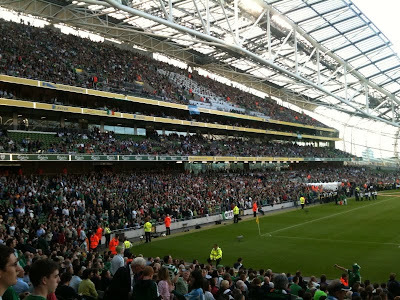 It was lining up as the Irish Republic versus the Irish Free State. In March 200 republicans seized the Four Courts buildings in central Dublin. The objective was to protest against the Free State sell out and to provoke a confrontation with the British who had not yet fully withdrawn in the hope of reuniting both factions. It did not work. The British did halt their evacuation as a challenge to Collins and the Provisional governments authority. This only made Collins more determined to stamp the authority of the Free State on the country. If you want to get a sense of what the Treaty debates were about watch this exceptional scene from the movie The Wind that Shakes the Barley. It is this scenario that led to one of the great and tragic ironic twists in Irish History. As negotiations were continuing (that may well have been successful) between Collns, the Provisional government and the anti treaty IRA whose leaders had barricaded themselves in the Four Courts an incident occurred in London that would have long lasting consequences for Ireland. On June 22nd a British Field Marshall named Sir Henry Hughes Wilson was assassinated by the IRA. Henry Wilson was a staunch Ulster Unionist, a conservative Party politician and an advisor to the new Northern Irish Government on security matters. He was a man many blamed for the increasing levels of sectarian violence aimed at catholics particularly in Belfast that saw hundreds, and some argue thousands of Catholic expelled from their homes. After his assassination the British decided they had enough of the instability in the south. It is believed that British Prime Minister Lloyd George and Secretary of state for the colonies Winston Churchill offered the Provisional Government in Dublin an ultimatum. Deal with the anti Treaty IRA (whom they assumed was responsible for the assassination) , or we will. 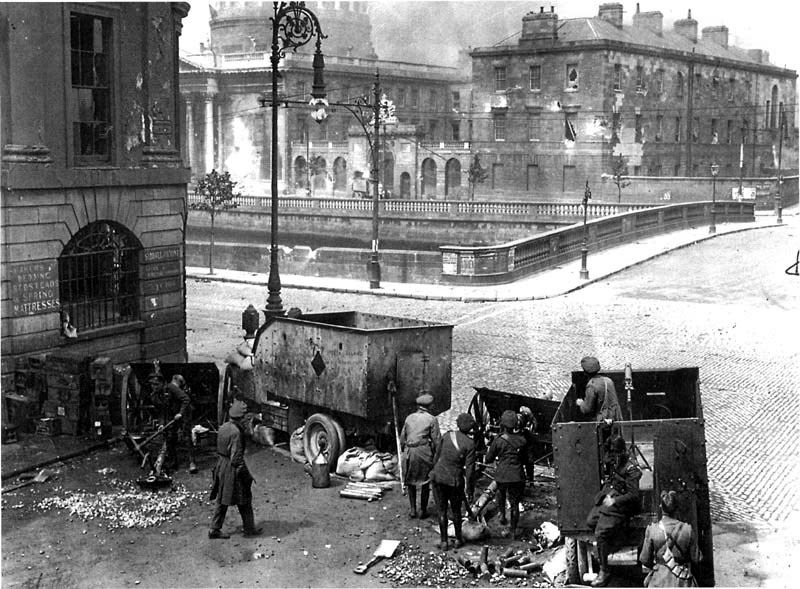 The Free State Army shelling the Four Courts in June 1922. Churchill suggested to Collns that the RAF could bomb the Four Courts with planes containing Free State markers but flown by British pilots. Collins refused. Churchill offered the Provisional government artillery. Collins accepted. 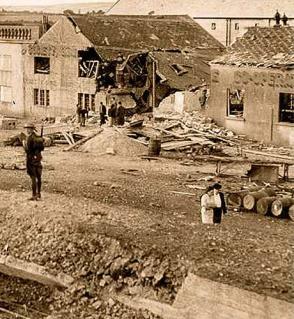 On the June 28th 1922 the Irish Civil war began when the New Free State army shelled the Four cCourts. The ironic twist I mentioned, history has almost certainly proved that the assassination of sir Henry Wilson was not carried out by the anti Treaty IRA. It was ordered by Collins who as discussed was hard line on the north. The Irish Defence Forces released this short video of the Army training with the Javelin Missile system in Glen of Imaal. Damian Duff prepares to take a free kick in Yesterdays match against Argentina in Landsdowne Road. The match was the first played in the new Aviva stadium where all future Ireland soccer and Rugby internationals will be played. I formed a rather controversial and unpopular opinion a number of years ago about a sectarian incident that happened at Holy Cross school in Belfast. This incident which received international attention at the time involved the all girl Holy Cross Catholic primary school which was located on the Protestant part of the otherwise Catholic Ardoyne area of Belfast. 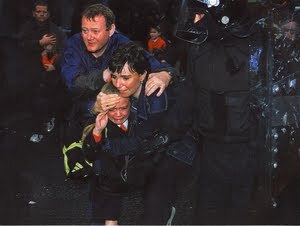 After an escalation of tensions in the area in the summer of 2001, caused by some sectarian murders, local loyalists began to obstruct access to the school for the Catholic pupils and their parents. The newly named Police Force of Northern Ireland which had replaced the Royal Ulster Constabulary over the summer as part of the Good Friday Agreement began to clear a path for the Catholic school goers. The images of hate filled loyalist faces hurling sectarian insults at children as young as four was a particularly disturbing sight. Things got even more ugly when loyalist terrorists, on three separate occasion threw pipe bombs at the school goers injuring police officers in the process. This seems like a pretty open and shut case. Loyalist sectarianism was exposed in all its ugly forms. And it clearly was. However, the opinion I formed which got me into a lot of trouble at the time was that it was wrong to use children to expose the savagery of loyalist sectarianism. To put it simply, if it were my child, I would have left them at home for the duration of the disturbances. I would not have let my child run a gauntlet of sectarian abuse in order to expose the bigotry of the other side. I believe this was the motive of some of the parents. Of course the parents involved were perfectly entitled to stand up to loyalist sectarianism. But those who continuously marched their children down the disputed road, particularly after the violence erupted, were in my opinion using their children to make a political point. It is always wrong to use civilians, particularly children for propaganda purposes. We see this regularly in the Middle East. Hezbollah and Hamas are experts at putting civilians in danger by firing rockets from heavily populated areas and when the inevitable response comes from the Israelis you can be sure that the legions of camera men, photographers and other PR personnel that work for Hamas/Hezbollah will be there to capture dramatic images of the suffering. In my opinion if a citizen of Gaza or southern Lebanon allows attacks on Israel to be launched from their home then they bare substantial responsibility for civilian casualties that are suffered at that location in the event of an Israeli attack. However I also believe that the Israelis are not entirely innocent in this regard, certainly not when it comes to the issue of Jewish settlements. A common accusation aimed at Hamas during the Cast Lead War was that they were using their own civilians as human shields. I am prepared to argue that building a civilian settlement in arguably the most disputed stretch of land on the planet is a similar tactic. I completely reject the "natural growth" argument of Israeli hawks. 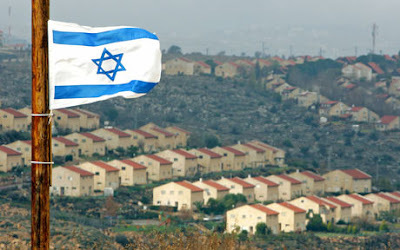 Israeli settlements have one Principal purpose, to undermine the future viability of a Palestinian state and in particular, Palestinian claims to Jerusalem. That goal of fulfilling the biblical prophecy of a greater Israel is achieved by placing Jewish civilians in the West Bank. It is wrong to put civilians at risk for the sake of a political or religious conviction. If a Jewish person from Europe, America or Australia decides to move themselves and their families to a West Bank settlement, land that is disputed in the extreme, then they are putting their children at risk for a political conviction. In the event that they or their family are attacked by terrorists, I believe that they must share some of the responsibilities for the consequences. Blogging was sparse last week as I have been attending a lengthy reunion of my late grandmothers family and her many decedents. 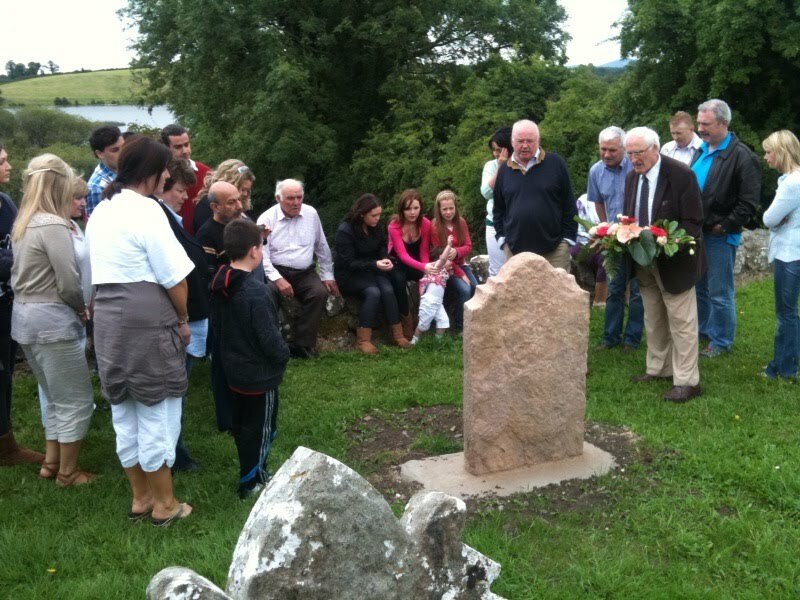 In all, over 200 people from the Brady clan congregated in Co Cavan to celebrate the event. It was wonderful, I met many relatives from all over the world including Canada, America, France, Pakistan and New Zealand. I also managed to get in some fascinating political conversations with some very interesting people whose personal experiences ranged from my Washington DC based second cousin who works for a major hotel chain that caters for the presidential inauguration balls (his personal recollections of the second Bush inauguration was particularly interesting) to my British based second cousin through marriage from Pakistan who volunteers with an organisation called "prevent" which works to discourage young Muslim men from embracing radical politics. As you can imagine, I was in my element. Thanks so much to all my relatives who made it such an unforgettable event. Below is a small sample of some interesting photos from the reunion. 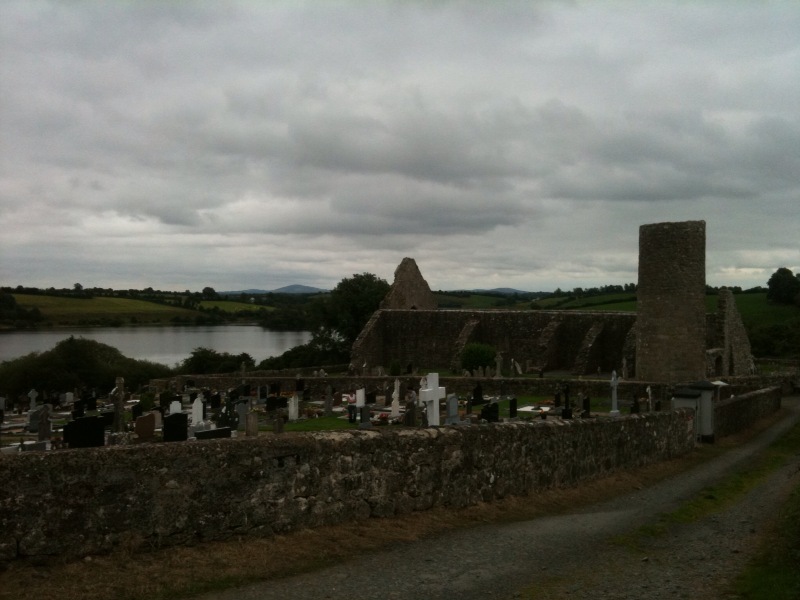 The beautiful Drumlane Abbey in Milltown Co Cavan. 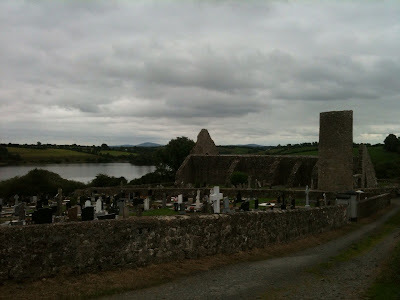 The 4th century monastery is where many of my ancestors are buried. My Great Uncle Tommy takes us on a tour of the historic graveyard. This particular plot contains the remains of my Great, Great, Great Grandparents who participated in 1798 rebellion. 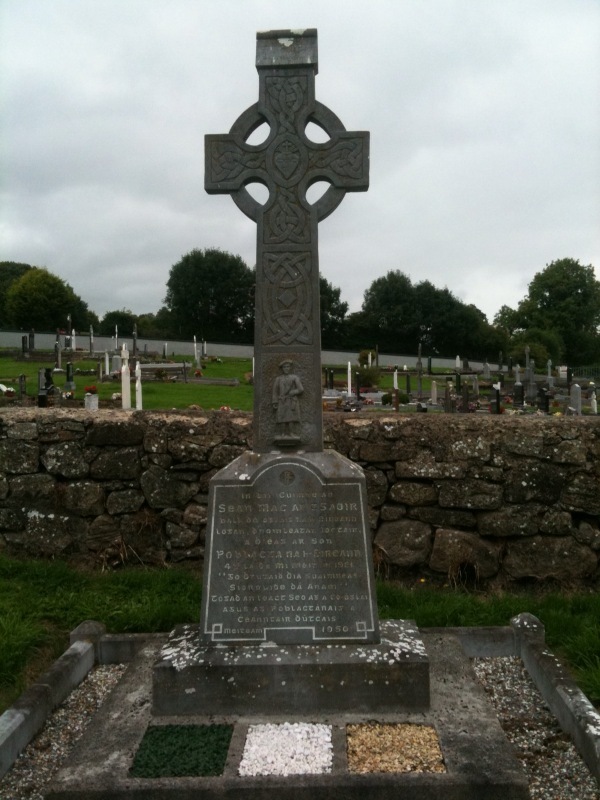 The same cemetery had a prominent grave to Sean McIntyre, an IRA man from the locality who was killed in June 1921, two weeks before the truce with Brutish forces. June 1921 was by far the bloodiest month in the Irish War of Independence. 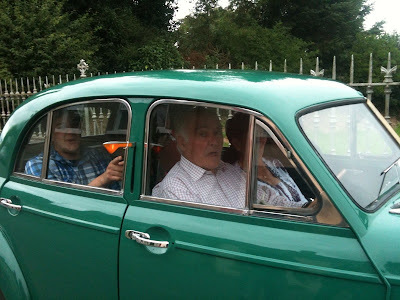 My Great Uncle Tommy takes some of the younger generation on a spin in his vintage 1949 Ford. Note the old fashioned indicators. Thanks again to all those who made it such a memorable week. Back to normality this week on Gubu World. Daily posting to come. Irishman and radical Muslim convert Khalid Kelly has returned to Ireland after a lengthy spell in Pakistan and possibly Afghanistan. We have discussed Kelly before on Gubu World in the context of Liam Egan's Muslim Public Affairs Committee. During a previous debate on radical Islam Paul over at A Modern Libertarian left this link about Kelly where the Dublin man rants about his dream of facing a British soldier on the Afghan battlefield. 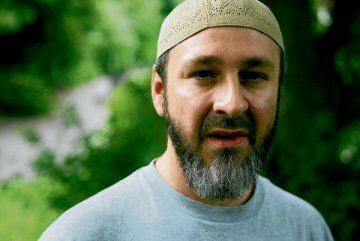 However it seems that his efforts in the region were unsuccessful as he has returned to Ireland for the first time since 1996 to set up a group called Islam for Ireland. This from Mary Fitzgerald of The Irish Times. Irishman Khalid Kelly – who dreams of seeing the ‘black flag of Islam’ over the Dáil – has returned from Pakistan to set up a group called Islam for Ireland. IT IS seven years since Khalid Kelly, Liberties altar boy turned Muslim convert turned radical blowhard, prompted heckling and jeers from a Late Late Show audience. Back then Kelly, dressed in black and grey robes and accompanied by a fellow member of British-based organisation al-Muhajiroun, defended the 9/11 attacks and claimed one day the world would be ruled by sharia law. Kelly became something of a poster boy for al-Muhajiroun and its founder, the controversial Syrian-born cleric Omar Bakri, and his association with the movement continued throughout the several reincarnations that followed its disbanding in 2004. Bakri and his followers developed a schtick that blended jihadist rhetoric with virulent anti-Semitism and homophobia. They revelled in the notoriety and acres of press coverage generated by their inflammatory pronouncements. Kelly regularly featured in breathless tabloid reports. He popped up on CNN to argue that the 2005 London transport bombings were justified because of Tony Blair’s foreign policy. Then suddenly the man some media outlets referred to as “the famous Irish Muslim convert” dropped off the radar. Rumours he had pitched up in Pakistan proved correct when a reporter for a British newspaper interviewed him there last November. Under the headline “Irishman wants to kill for Islam”, Kelly boasted of undergoing weapons training in Pakistan’s tribal badlands. “I’m already on the path to jihad,” he said. “Next week, inshallah, I could be in Afghanistan fighting a British soldier.” But Kelly’s dreams of jihad turned sour and he never made it to Afghanistan. The possible reasons for this were hinted at in an interview he gave to the Arab newspaper Asharq Al Awsat some years ago. Kelly said many people in the Pakistani frontier town of Peshawar had warned him that, because of the colour of his skin and appearance, the Taliban might kidnap him for ransom or kill him if they suspected him of being an American spy. In Dublin last week, Kelly explained he believed intelligence agencies were tailing him in Pakistan and he began to fear for his safety. “I went there to join people who were likeminded and help establish an Islamic state,” he says. “But as a white convert, I stuck out like a sore thumb.” Instead, he returned to Ireland in April and has been here since. In some ways, he seems different to the man who stirred such outrage on RTÉ in 2003. His beard is now threaded with grey and his face is turning jowly. He also seems far less cocky. Kelly is coy about what exactly prompted his hasty departure from Pakistan and what happened between that point and his arrival in Dublin – he mutters about his passport being “lost or stolen” in eastern Europe and mentions being deported somewhere along the way. Soon after returning to Ireland, Kelly was ruffling feathers within the Muslim community here. Even though he now prefers to be known as Abu Osama (Arabic for “father of Osama”, a reference to the son he named after Osama bin Laden), people remembered him – Kelly and his al-Muhajiroun cohorts previously tried and failed to gain a foothold here. Kelly was one of the most vocal speakers at a small demonstration outside the Belgian embassy in May. He told those gathered to protest against Belgium’s proposed ban on full-face veils that Europe was oppressing Muslims, and that he dreamt of seeing “the black flag of Islam” over Dáil Éireann. He also railed against the use of Shannon airport by US troops, and criticised the participation of seven Irish army personnel in the UN-mandated Nato-led mission in Afghanistan. He made similar statements in an interview with Metro Éireann newspaper earlier this month, adding that Ireland is a “target for attacks” because of its involvement in Afghanistan. The resulting front-page article, headlined “We must listen to bin Laden” prompted complaints from Muslims living here. Many consider Kelly an attention-seeking nuisance. He says he was recently told to move on while talking to a group of men at one of Dublin’s bigger mosques. He dismisses those who say he and his message are not welcome in Ireland as people “whose Islam is in doubt”. Kelly complains he has been visited on several occasions by the security services since his return. He says he is seeking legal advice following one such encounter at his Dublin home last week, which he alleges resulted in a physical confrontation. The story of how Kelly, a former nurse, converted to Islam while serving a jail sentence for illicitly distilling and selling alcohol in Saudi Arabia, is told in Holy Wars , a new documentary currently showing in film festivals in the US. Five years in the making, it charts the personal journeys of both Kelly and Aaron Taylor, a Christian missionary from the US who tries to proselytise in Muslim-majority countries. Film-maker Stephen Marshall followed Kelly to Pakistan. Promotional shots show Kelly inspecting the wares at a gun market in the Northwest Frontier Province. In a recent interview with a US newspaper, Marshall summed up many of the contradictions of the man once known as Terry Kelly. So what next for Khalid Kelly? He claims he came back to Ireland only to get a new passport before deciding where to resettle with his family – his sons Osama and Mohammed live in Britain with their mother, a Pakistani woman whom Kelly met through associates of Omar Bakri. However, he told Metro Éireann , he plans to establish a group here with the title “Islam for Ireland”. The name echoes that of Islam4UK, al-Muhajiroun’s most recent reinvention until it was banned in Britain in January on grounds of national security. Kelly says he remains in regular contact with his mentor Bakri, who fled to Lebanon following the London bombings. When I interviewed Bakri in the Lebanese town of Tripoli three years ago, he praised Kelly but said he had no interest in setting up an organisation in Ireland. The return or Mr Kelly is certainly going to make for some interesting posts on Gubu World in the near future. You may remember my recent post about the Muslim protest outside the Belgian Embassy in Dublin. At the time I thought Liam Egan was the principal organiser. According to Mary Fitzgeralds article Kelly was central to it as well. This indicates that he is not back in Ireland to keep a low profile. I for one welcome the challenge of confronting his agenda through the medium of the blogosphere. He has already claimed to have been assaulted by the Irish Police. It is of course a good thing that the Garda are keeping an eye on him. Although I believe his description of what happened is likely an unmitigated lie. This from the radical website Revolutionary Muslim.org which has Irish contributors. Khaled kelly was brutally beaten up in his Dublin Home on Wednesday 21st July 2010 by what appeared to be an operation involving over 30 armed Irish Police in a totally unprovoked and premeditated attack. The said attack against Mr Kelly was primarily carried out by 5 or 6 plain clothed officers during which his face and body was punched and kicked leading to him being left in a pool of blood with his nose broken and body severely bruised. As I have always said. Ireland's Muslims simply do not have the appetite for the nonsense that eccentric attention seeking converts like Kelly and Egan spew. On the same site as above, a real Irish Muslim responded to Kelly's description of the assault better than I ever could. I want to defend Ireland’s reputation from this liar and fraud. Ireland is a place that has shown solidarity to Muslims around the world and whose people have treated us with the typical friendliness, kindness and hospitality that the Irish are famous for, a nation that knows what it means to be oppressed and vilified by colonial powers. Abu Osama (Khalid Kelly) went to Juma at the South Circular road mosque in Dublin a week after the alleged incident and there wasn’t a scratch on him, he’s been known to exaggerate and his reputation in the community is in the mud since 2003, to say that the Gardai didn’t have cause to investigate him is nonsense, only last month in an interview in the Metro Eireann he said that Ireland was a legitimate target for attack. How does that make me feel knowing that in a country that has given me and my family security my children might be killed in an attack inspired or planned by this man? I am absolutely disgusted. Kelly can either reform himself or leave, as he behaves now he is not welcome. Interesting times ahead I reckon. Below is a trailer for the documentary "Holy Wars" featuring Khalid Kelly as mentioned in the Irish Times article above. It gives us a good indication of the type of man we are dealng with. I recently read the late Senator Ted Kennedy's memoirs. He said one thing in particular about his family that struck me. He said he did not believe in the myth of the Kennedy Curse because he did not think his family suffered more tragedy than most large families. Quite a remarkable thing to say really considering he had buried four siblings before his 40th birthday. But today's Interesting Random Piece of History is not about JFK or RFK. It is about Kathleen Kennedy, the eldest of the Kennedy daughters. Known to be somewhat of a wild child she made her way to England during the second World War to work as a journalist. The picture above is of her wedding in May 1944 to prominent aristocrat William Cavendish, son of the Duke of Devonshire and nephew of Lady Dorothy Cavendish, wife of future Prime Minister Harold MacMillan. The wedding was not met with approval in the Kennedy household as Cavendish was not a Catholic. 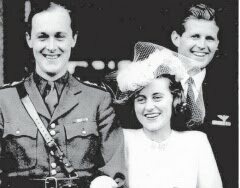 As a result only Joseph Kennedy Jr, who was stationed in England at the time, attended the wedding. The eldest Kennedy sibling is also pictured here giving the bride away. The image of the happy couple above is a very poignant one for one overriding reason. Both men in the picture would be dead within three months. William Cavendish, a major in the Goldstream Guards was killed in action in Belgium in September 1944 not long after his unit participated in the liberation of Brussels. Three weeks later Joseph Kennedy Jr would lose his life after he participated in a daring military experiment. He piloted a B-24 Liberator filled with explosives over the British Channel. The intention was for him to bail out over the Channel at which point another air craft that was shadowing Kennedy's plane would guide it using remote control to crash at its destination which was a German V2 rocket launching site in France. Unfortunately the explosives laden air craft detonated prematurely Killing Kennedy and his co pilot. According to Ted Kennedy's memoir his eldest sister never quite recovered from this double tragedy. She herself would be killed in a plane crash in France in 1948.